Ferdinand Lee Clarke : Waikiki, 1888. 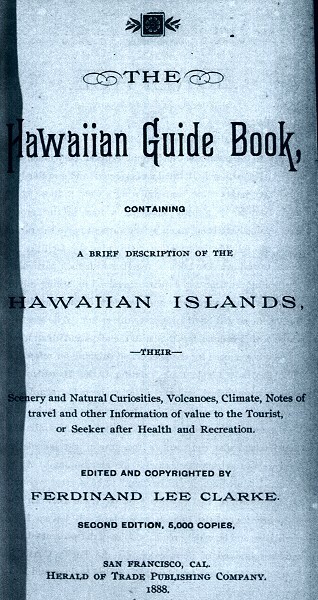 The poem, Waikiki, is by Rollon M. Daggett, the brief description is attributed to Clarke. Stands sentry 'round the'crescent shore. Keeps watch beside the lanai door. Their sweetest words at Waikiki. Nor heed old ocean's stern recall. And singing, sleep at Waikiki. "Oh, Waikiki! 0 scene of peace ! 0 home of beauty and of dreams! Can chord the heart to sweeter themes. The angels smile on Waikiki." Thee miles from Honolulu is the favorite bathing place, lovely Waikiki. A 'bus runs out to the bath house every hour or so, the charge both ways being 25 cents. At the bath-house are kept the usual appliances for enabling the visitor to indulge in a dip in the warm, bouyant surf, and there are, too, comfortable hammocks hung all about for the better enjoyment of the consequent siesta. The charge for all this is 25 cents, and one can stay as long as they like in the water or hammock. It is a glorious place to dream away an afternoon, and many there are who do so. Near the bath-houses is Kapiolani Park with its many winding roads and paths shaded by the graceful algeroba, and within its limits is a fine race track. beach opposite the park are beautiful summer residences- "bungalows" they may be called- where everything is arranged to enable one to realize what perfect repose and quiet is on the shore of a tropic sea in a tropic clime. Beyond this slumberous beach rises "Diamond Head," to visit which properly one should hire a saddle horse for the day. Then the ride is delightful, the road leading past the mouths of two or three lovely valleys, and turning seaward finally brings one out on the summit of this old crater, 700 feet above the sea. The view from that point 's grand, and on the way one passes over an ancient battle ground still marked by the bleached bones of fallen chiefs and savage soldiery. The ride can be extended on beyond Diamond Head for two or three miles, and new scenes visited. Geoff Cater (2013) : Ferdinand Lee Clake : Waikiki, 1888.